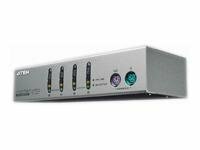 ATEN desktop KVM switches provide both style and functionality for the SOHO environment. 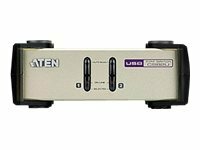 ATEN desktop KVM switches allow you to switch seamlessly between up to four HDMI, DVI, or VGA-emabled PCs, and share USB peripherals and audio functionality from a single console. 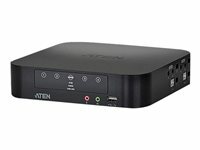 Ideal for multimedia applications, the ATEN desktop KVM offers the ultimate in space-saving, streamlined KVM technology for the desktop. 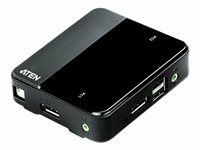 The CS72D comes with ATEN’s Video DynaSync™ technology, which eliminates boot-up display problems and optimizes resolution; it carries several convenient features, such as Power On Detection, 2.1 channel audio capability and USB2.0 peripheral sharing, as well as provides quick and easy methods to access computers. The CS1942 further improves on previous KVM designs with the latest Mini-DisplayPort and Mini-TOSLINK connectors. 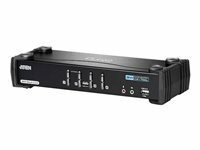 It also provides the capability of digital video & audio with reliable Ultra high resolution, vivid picture quality and surround sound with SPDIF connections. The CS1942 is ideal for multimedia applications and offers the ultimate in space-saving, streamlined KVM technology for the desktop. Dual interface It supports computers with PS/2 or USB keyboards and mice. Console mouse port emulation/bypass feature Console mouse port emulation/bypass feature supports most mouse drivers and multifunction mice. 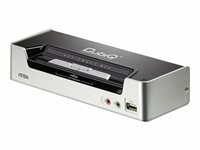 Superior video quality Supports 480i, 480p, 720p, 1080i, and 1080p(HDTV)/1920 x 1200(DVI). Power on detection If one of the computers is powered off, the CS1794 will automatically switch to the next powered-on computer. 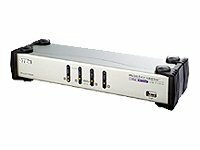 Video DynaSync Stores the console monitor's EDID (Extended Display Identification Data) to optimize display resolution. 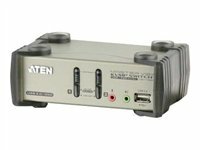 The Master View Dual-View CS-1744 USB KVM Switch brings dual head video functionality to ATEN's USB KVM switch technology. Now, four dual head computers can be accessed and controlled from a single console that consists of a USB keyboard, USB mouse, and two VGA, SVGA, or Multisync monitors. 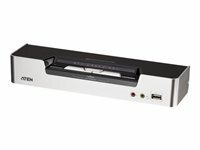 In addition, the CS-1744 incorporates a two port USB hub that allows each of the computers to share any USB peripherals connected to the hub on a one computer at a time basis. Recognizing the importance of sound, the switches are also audio enabled. 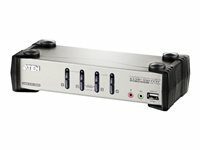 A single microphone can provide audio input to each of the computers, and you can listen to the audio output of each computer on a single set of speakers (on a one-at-a-time basis).